California Republican Rep. Darrell Issa, who will run the House Oversight and Government Reform Committee if Republicans take over the House, is promising that he and his party will not move to impeach President Obama - at least as things now stand. "Not a chance at this point. I don't see it happening," Issa said in an interview with Bloomberg's "Political Capital" that will air over the weekend and was reported by The Hill. 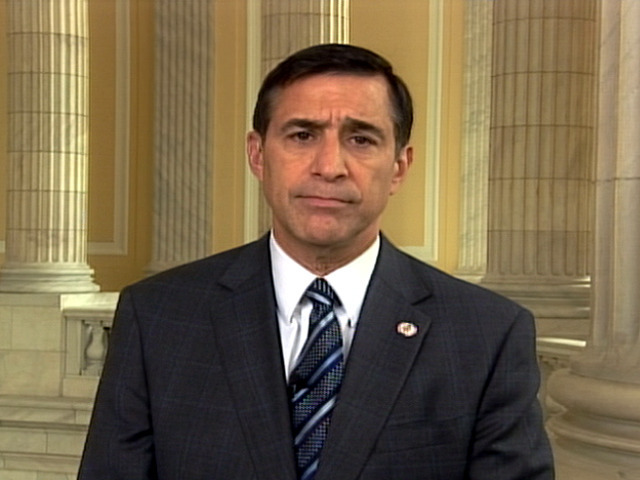 "Look, disagreeing with the president -- the president using his authority, maybe even misusing it -- that's not what impeachment's for," Issa added. "Do we have disagreements? Yes. Do we want to see that the president strictly adheres to process? Yes." Democrats have speculated that Issa, who has pushed for a number of inquiries into the Obama administration, would use his newfound power under a GOP majority to aggressively investigate the administration. Rep. James Clyburn of South Carolina said Issa will seek to "delegitimize" Mr. Obama, and Pennsylvania Gov. Ed Rendell warned of "wackos" wielding subpoena power in a GOP-run House. But Issa, who has been deemed Mr. Obama's "annoyer in chief," is trying to counteract the notion that he is poised for partisan overreach. He told the Wall Street Journal he has no intention of overreaching and wants to work with Democrats "to get things done." That doesn't mean he won't be busy. The WSJ ticks off what Issa calls his top priorities: "Dig into excesses in the federal pension system; trim Medicare waste; downsize and try to save the U.S. Postal Service; investigate potential abuses within mortgage giants Fannie Mae and Freddie Mac." There are also potential items on his agenda that seem like red meat for his party's base, including investigations of ACORN and "Climate-Gate." Issa spokesman Kurt Bardella insisted to TPM that "the notion that we're prepared to embark on an epic subpoena-led politically-motivated investigatory effort is just wrong." And Issa is vowing not to investigate alleged White House job offers to clear the field for its preferred Democratic candidates in primaries, an issue he pushed hard in the past. He said the practice also went on under President Bush and while it is not impeachable, it needs to stop. Another top Republican, Rep. Mike Pence, says his party isn't interested in compromise if it takes the House. "Look, there will be no compromise on stopping runaway spending, deficits and debt. There will be no compromise on repealing Obamacare. There will be no compromise on stopping Democrats from growing government and raising taxes," he told radio host Hugh Hewitt last night. "And if I haven't been clear enough yet, let me say again: No compromise."